Background: Ankylosaurs are one of the least explored clades of dinosaurs regarding endocranial anatomy, with few available descriptions of braincase anatomy and even less information on brain and inner ear morphologies. 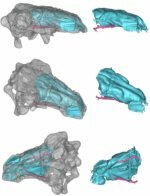 The main goal of this study is to provide a detailed description of the braincase and internal structures of the Early Cretaceous nodosaurid Pawpawsaurus campbelli, based on recently made CT scans. 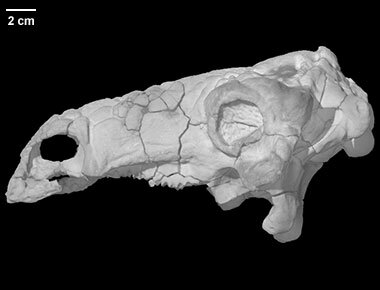 Methodology/Principal Findings: The skull of Pawpawsaurus was CT scanned at University of Texas at Austin (UTCT). Three-dimensional models were constructed using Mimics 18.0 (Materialise). The digital data and further processed 3D models revealed inaccessible anatomic structures, allowing a detailed description of the lateral wall of the braincase (obscured by other bones in the articulated skull), and endocranial structures such as the cranial endocast, the most complete inner ear morphology for a nodosaurid, and the interpretation of the airflow system within the nasal cavities. 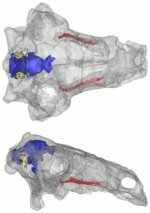 Conslusions/Significance: The new information on the endocranial morphology of Pawpawsaurus adds anatomical data to the poorly understand ankylosaur paleoneurology. The new set of data has potential use not only in taxonomy and phylogeny, but also in paleobiological interpretations based on the relative development of sense organs, such as olfaction, hearing and balance. Click here to download the original CT data (1.1 GB). This specimen, the holotype, was collected from the Paw Paw Formation, SMU Loc. No. 263, Tarrant County, Texas. It was made available to the University of Texas High-Resolution X-ray CT Facility for scanning by Dr. Louis Jacobs of Southern Methodist University. Funding for scanning and image processing was provided by Dr. Jacobs. This specimen was scanned by Matthew Colbert on 4 February 2014 along the coronal axis for a total of 1088 slices. Voxel size is 0.2275 mm. Lee, Y.-N. 1996. A new nodosaurid ankylosaur (Dinosauria, Ornithischia) from the Paw Paw Formation (late Albian) of Texas. Journal of Vertebrate Paleontology, 16, 232-245. Click on the thumbnail to the left. Pawpawsaurus campbelli (FWMSH93B.00026), skull in lateral (left) and dorsal (right) views. The bone is rendered semitransparent in the image below to allow the observation of the brain (in blue color) and the nasal cavities (in light blue color). Click on the thumbnail to the left. Pawpawsaurus campbelli (FWMSH93B.00026), skull in anterolateral, dorsolateral and anteroventral views. The bone is rendered semitransparent (left) and is removed (right) to allow the observation of the nasal cavities (in light blue color). Click on the thumbnail to the left. Pawpawsaurus campbelli (FWMSH93B.00026), skull series. The bone is rendered solid (right) and semitransparent (left) allowing the observation of the brain (in blue color). Click on the thumbnail to the left. Pawpawsaurus campbelli (FWMSH93B.00026), skull in dorsal and right lateral view. The bone is rendered semitransparent to allow observation of the brain (in blue color). Click on the thumbnail to the left. Pawpawsaurus campbelli (FWMSH93B.00026), skull in anterolateral view. The bone is rendered semitransparent to allow the observation of the nasal cavities (in light blue color) and de dorsal alveolar canal (in pink color). To cite this page: Dr. Ariana Paulina-Carabajal, Yuong-Nam Lee and Louis L. Jacobs, 2016, "Pawpawsaurus campbelli" (On-line), Digital Morphology. Accessed April 24, 2019 at http://digimorph.org/specimens/Pawpawsaurus_campbelli/.